I can't believe this sweet little boy is about to be 2! How time flies! Well Mr. DC is here! He arrived at 3:52am on Oct 24th. He was 8lbs 20.5 inches. I went in to labor at 3pm Sat Oct 23 contractions got to 3 mins apart at 5pm so we headed to the Hospital just to be sent home at 7 since I was only to 1cm and no change. The next 3 hours were horrible and headed back at 10pm. I was to 3cm and 90% effaced. Had an epidural by 11pm and soon after was at 5cm and they broke my water. At about 2am I was at 7cm. At 2:30am his heart rate had started to drop with the contraction so I signed paper work to approve a c-section if it didn't change , they applied internal monitors. At 3:15ish his heart rate dropped all the way to 60bpm so they ended up doing an emergency c-section and was born at 3:52am... Oh BTW I was 9cm dilated at this point too! He is our perfect little boy! Still waiting and very pregnant! MY U/S on Tuesday said he was measuring between 8lbs 14oz and 9lbs 2oz! He is going to be one big baby bog! Well since then I have been diagnosed with Irritable Uterus at 29 weeks and Pubic Symphysis at 34 weeks. I have gained a total of 8lbs ( 5 of that in the last 3 weeks) with my pregnancy and I got my husband home from Iraq. Donavan is perfect. His week 32 US put him at 4.5lbs and 47% for growth and size. This is his $D US at 33 weeks. He is going to be my chubby cheek little boy. I can't wait to meet him! Being 36 weeks means he can arrive at anytime. I am ready for the all the time pain to be done in my crotch. I tell people it is like a migraine in my crotch it just hurts all the time! I am seeing a Physical Therapist twice a week and she is amazing with stretches and massage techniques. Now we just wait for him to arrive. I love having my husband home and can't wait to see my sister in about 10 days. Sorry again for being such a bad blogger. Not much is new and as that is it is hard to blog. Tim is still overseas and Little C is kicking me every day. I had a really bad emotional day a week or 2 ago and i noticed that Little C decided to stop moving. He took about 24 hours to get back to kicking me again and he had me worried, but after dr. Google I read that this is really normal after a super emotional or stressful day and not that the day was stressful but I had a "couldn't stop crying" kind of day. It is nice to be home now for awhile my baby shower is going to be in about 2 weeks. I didn't want it before the 6th month mark. 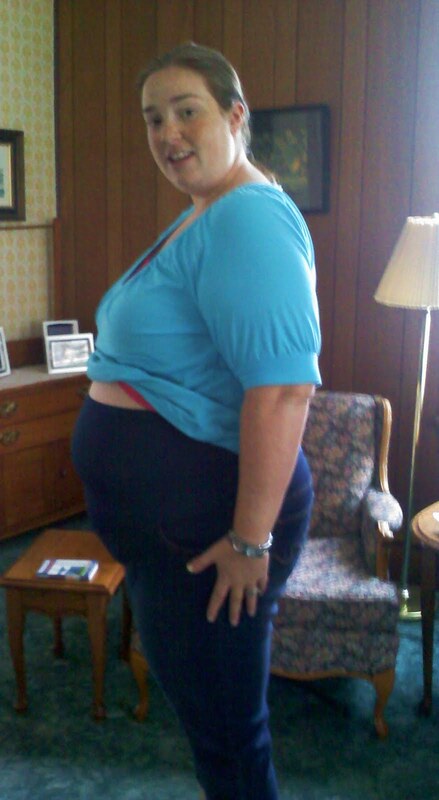 I am putting my 1 picture of me in maternity capris I really don't look pregnant unless I am wearing them and I have only had 2 pairs of pants for a week now. I am still -2lbs in my pregnancy weight but the dr is very happy with it as I conceived at 240lbs. 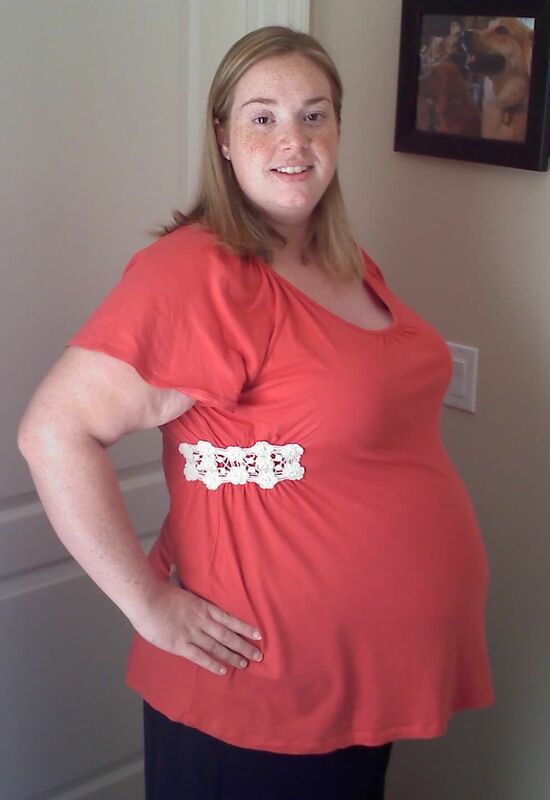 The picture is me at 22 weeks. Rebecca at The road less traveled was only 4 days farther along then I am when she delivered early and lost her little girl this past Sunday. This just weighs so heavy on my heart and adds a little worried voice in my head that pregnancy is just so fragile I don't think the worry will every go away! I try not to be a fretful person so I continue to go about my day and enjoy every kick 10x more! I hope you all have a wonderful 4th I will miss my husband a little extra on Sunday! P.S. Oh something no one else tells you about is middle of the night tossing and turning belly cramps. I get the worst almost like a charlie horse on the side of my belly if I turn and stretch the wrong way in the middle of the night! It only lasts a few mins but man it is not fun. I have been a bad bad blogger. It has been over a month since I have posted and I can't say a ton has happened. It is hard to blog when life is just being normal. Tim has now been deployed for over 12 weeks so he is past the half way point. Well the big news you have all been waiting for we are having a BOY!! Oh my I can't believe it. We were told by the Dr's it would be a 75% chance of a girl so this is just amazing. 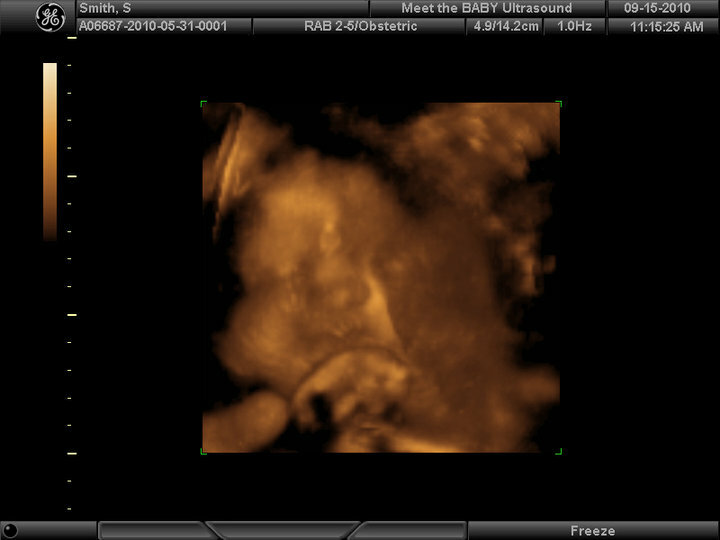 We found out the 3d way when I was 18weeks. It was Memorial Day and Tim's parents were visiting from GA so they were with me and Tim and my parents were able to watch it live over a link. The best picture was the one my husband took. Yes that is him watching from his room. 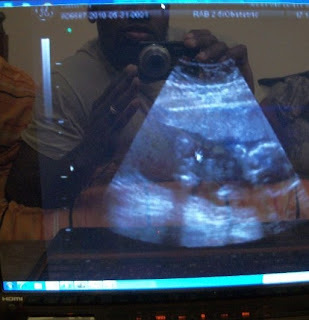 It was extra special as this was the first Ultra Sound he has been able to see. 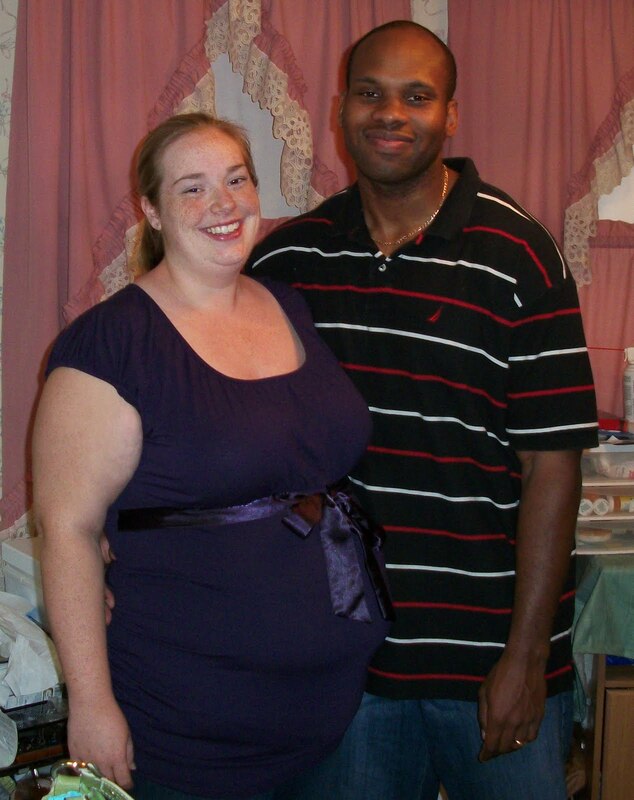 He wont be home till I am past 30 weeks so I will be very pregnant by then. I hope to take him back and have another 3-D scan then. It seemed week 18 was the beginning of it all I felt Little C move for the first time and he has been non stop ever since. I had my full scan at 19 weeks and he is already 10oz and his arms and legs are measuring a full week ahead.. He is going to be one big little man! They said everything was perfect but they couldn't get the full spine so I go back next week for another US! I can not take this Florida heat much longer. The past week has been full of 90+ and 105-112 heat index! I am loving my AC! Well I can't promise to blog more as my life has just been normal and the normal stuff tends to get boring. Little C and I will both continue to keep growing.